Legendary Rock Steady Crew Deejay, DJ JS-1, is proving that Hip-Hop has a heart and can use its powers for good with his upcoming benefit event “Serious as Cancer.” The benefit – inspired by JS’ own experience with family members who struggled with the disease – will donate 100% of the funds to aid children’s Cancer research. Named for the infamous Rakim lyric, the event boasts of performances by Masta Ace, O.C., Sadat X, Rahzel and many more special guests to be announced as the date draws near. 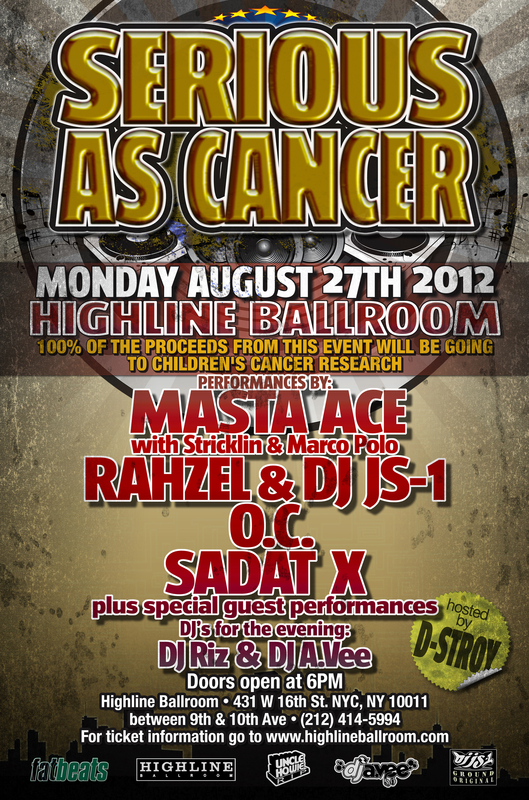 Serious as Cancer goes down August 27th at Highline Ballroom. Get your tix here.